Thats me, the leprechaun on the left! Managed to pip this guy just at the line after a nip and tuck battle all the way around. A good run on a course I didn’t know and even a PB at 8km to add to it. I finished 8th place in 28.41. 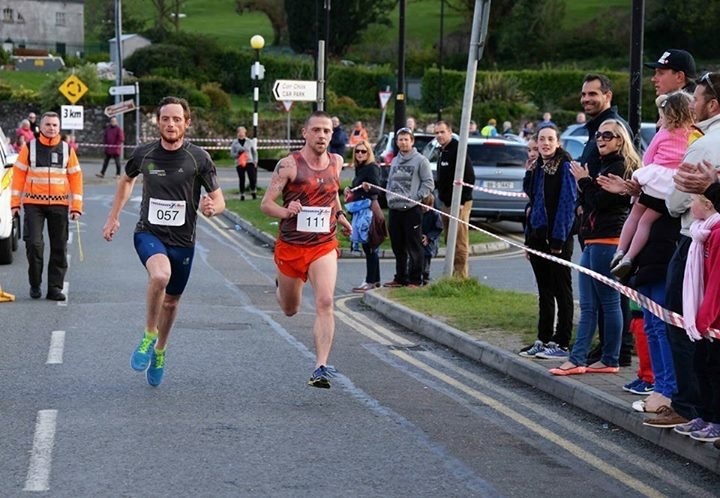 It was a great friendly event in Cork with huge crowds out to support and run. I was working in Crosshaven, Cork all week so training was a bit all over the place, especially when I somehow managed 2 punctures on the bike on my first night, one of which involved a really big nail damaging the tyre! This meant I would stick to the less mechanical form of training for the week and slog it out with some road running. I got 18km in on Tuesday evening and then the race wednesday so happy enough. Back on the hills today and feeling good. The plan now is for a few more sessions before next weekends race “Connemara Adventure Challenge” and some rest a few days before it. Apologies for the lack of blogging of late. The lack of routine and being away from home means I am a bit all over the place but hopefully I can get back on track this week.